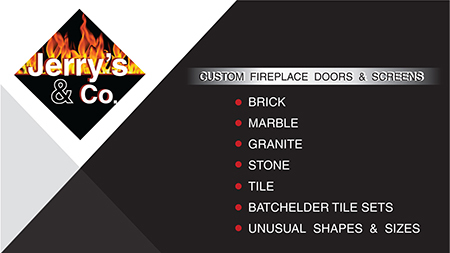 At Jerry's & Co., expect our fireplace glass doors and screens to be of the highest quality. Our products are not mass produced and receive the highest attention to detail. Contact us as soon as possible for further information. On our gallery page, you'll find some of the best displays of our craftsmanship. Check back often as we will be updating our collection of images. Custom Fireplace Doors come in many metal finishes and stove paint colors.